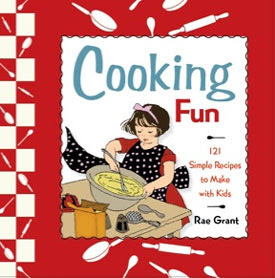 A wave of nostalgia sweeps over me every time I crack open the pages of two new books, Crafting Fun and Cooking Fun by author Rae Grant. The books with their retro design and classic recipes and crafts, send me back to my childhood and remind me of days spent crafting and cooking with my mom and grandma. Both my mom and grandma can cook up a storm and are just as accomplished sewers and crafters. My own skills can't even begin to compare. Luckily, my kids have also been able to witness the magic in their kitchens and at their sewing machines. Now with the help of Grant's vintage-styled books, I can continue the legacy of good home cooking and simple, classic crafting. If you've been searching for the perfect children's cookbook, Rae Grant's Cooking Fun: 121 Simple Recipes to Make with Kids is worth a look. Old-fashioned, comfort food type recipes fill the book, and Grant shares all those familiar recipes that every mother should hand down to her children. Sloppy Joes, pancakes, strawberry shortcake, banana bread, and broccoli soup are a few of the 121 mouth-watering recipes. Nothing fancy and everything homemade, that is how my grandmother cooks and apparently Rae Grant's grandmother as well. The beginning of the book includes a section of kitchen basics and tips, cooking terms, measuring equivalents and even suggestions on keeping a "green" eco-friendly kitchen. Grant's artful use of vintage graphics throughout makes the book eye-pleasing and enticing. My daughter and I tried out the snickerdoodles recipe on page 124. The name snickerdoodles has always cracked me up since I was a little girl and they really are a perfect snack with milk, a good change from chocolate chip cookies. They turned out excellent, by the way! My mom ran a licensed daycare out of our home, so I grew up making plenty of crafts. She searched books and magazines for little projects and activities to do with the kids. Some of the classic crafts I remember making can be found right in Crafting Fun: 101 Things to Make and Do With Kids like paper drinking cups, waxed paper leaves, snow globes, and tussie-mussies. A few crafts include accompanying factual information like a U.S. State Tree Chart along with the skeleton leaf prints activity. All the projects are ordered by seasons: Autumn, Winter, Spring and Summer. Vintage style illustrations grace the pages of the book skillfully arranged by Grant, an experienced book designer. Kids will have fun using simple household materials to construct their crafts, and the easy-to-follow directions tell them exactly what steps to take. Crafting is a perfect way to keep kids occupied during summer vacation! Win a copy! 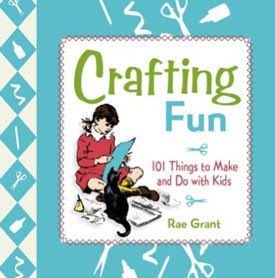 Rae Grant and St. Martin's Press have kindly offered to give away (1) copy of Cooking Fun and to a Brimful Curiosities reader and (1) copy of Crafting Fun to a different Brimful Curiosities reader. If you have a preference, leave it in your comment. Best Chocolate Pudding made by my mom. Minta's Apple Crisp for sure, my Mom + Grandmother were always making it growing up! Best chocolate pudding, standing up on a stool by the stove! I'd love to try the baked apples. I'd prefer the craft book, because my son has a gazillion allergies. Looks fantastic - thanks! The Minta’s Apple Crisp reminds me of cold winter nights when I was a child. It would be the Peanut Butter cookies! I'm a Subscriber of your blog. Both of these books sound great!! I'd love to have some fun w/ my kiddos with either of them! Both books sound great. When I was young we always made my fathers favorite cookies which were Peanut Butter Cookies. Please include me in your giveaway. Oh, definitely Snickerdoodles. My great grandmother made those every weekend. Snickerdoodles! My mom used to make those all the time! Yum! Creamy Macaroni & Cheese. My favorite as a child and still is today. Thank you! Great giveaway - I'd love to be entered for the Crafting Fun giveaway. I'll say Minta's apple crisp. Thanks for the wonderful giveaway. I would love to win a copy of Cooking Fun!! Those recipes look so good! The brownies make me think of when my mom used to make them while we were in school and they would still be hot when we got off the bus! I subscribe in my Google Reader! Peanut butter cookies.. which is my favorite until now! Minta's Apple Crisp makes me think of my childhood. I always loved when my mom made it! Rainy Day Rice Pudding without a doubt. We used to have rice pudding about everyother week when I was young. I still love it but don't eat it as often. I am for the baked apples. 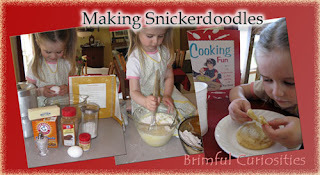 My children have 3 of the 8 major food allergies, so many of the recipes would have to be altered. I would like to enter for Cooking Fun. Ham and Ginger Ale reminds me of my Gma, and Easter sunday! She'd make a huge ham and baste it with ginger ale, and I'd steal sips of the ginger ale, lol! What yummy recipes! Following on Twitter and tweeted the giveaway! Rice pudding/apple crisp were staples of my childhood. The "Icebox Cookies" recipe reminds me of my childhood. I would love to win either book, but "cooking Fun" would interest me the most. I love the Whipped cream recipe! Once you make whipped cream you'll never want cool whip! I'm following you on twitter as @susieqtpie and I tweeted! Baked Apples are still one of my favorites on a cold winter's day. 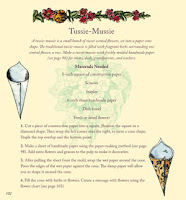 A warm delicious treat just like Granny makes. I loved when mom made peanutbutter cookies! brownies...we were big on brownies...who doesnt love them! Lemon bars remind me of my childhood. My mom used to make some wonderful ones! Icebox cookies were always a favorite when I was a kid.